Explanation: This vintage 60-kopek stamp celebrates a dramatic achievement. On the 7th of October, 1959 (7/X/1959), the Soviet interplanetary station which has come to be called "Luna 3" successfully photographed the far side of the moon giving denizens of planet Earth their first ever view of this hidden hemisphere. Lacking the digital image technology familiar now, Luna 3 took the pictures on 35mm film which was automatically developed on board. The pictures were then scanned and the signal transmitted to Earth days later in what was perhaps also the first interplanetary fax. In all, seventeen pictures were received providing enough coverage and resolution to construct a far side map and identify a few major features. 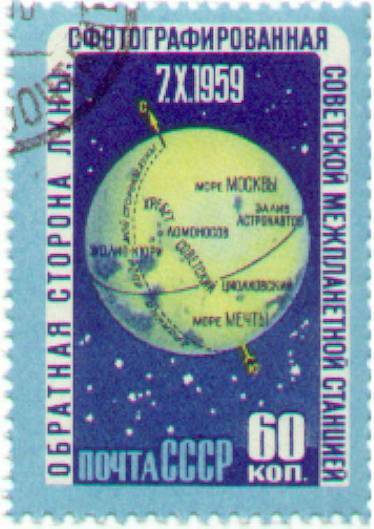 Depicted on the stamp are regions dubbed the Sea of Moscow, the Soviet Mountains, the Bay of Astronauts, and the Sea of Dreams.